Princess Sofia of Sweden attended the Global Child Forum 2015 at the Royal Palace on November 26, 2015 in Stockholm, Sweden. 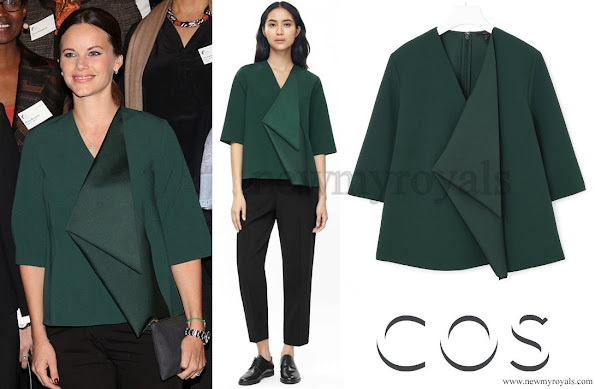 The Princess wore COS drape detail A-line top. The top retails for $97.00. (890 SEK) on the ( COS ) website. very nice outfit. Sophia is beautifull here. Looks more like something CPV would wear. Maybe Sophie is broadening her sartorial horizons! She is looking beautiful, sporty and elegant - very authentic. What an interesting design for a pregnant woman.The colour is just perfect for her. I am surprised at how much I like it on Sophie; although I would have chosen a softer hairstyle to go with it, to soften the lines. The flap irritates me but hey...at least it's not Natan!